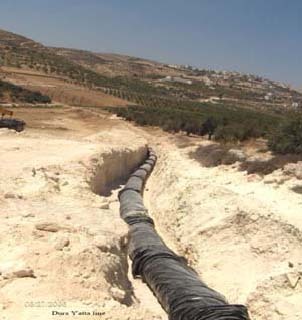 600mm ductile iron pipe between Halhul and Hebron, to the proposed Dura reservoir and then to Yatta, to the south of Hebron. The Construction works shall comprise of 5000m3 reservoir at Dura and an approximately 19,000m of 600mm diameter of ductile iron pipeline through urban and rural areas including all the ancillary pipe work, fittings and valves. Design and Supervision Consultancy Services.